03-12-2018 14:00 Aula Salvini F. Sannibale The VHG-Gun Electron, an electron source optimized for high-brightness, high-duty-cycle applications. 13-11-2018 11:00 Auletta B-1 Luca Di Luzio A proof of the Axion ? 09-11-2018 15:30 Aula Conversi Antonella Avagnano Seminario introduttivo alla mostra "Pollock e la scuola di New York"
20-12-2017 14:30 Aula B.Touschek Holger Bech Nielsen (Niels Bohr Inst.) PDF Dark Matter, Double Supernova Neutrino Explosion, Degenerate Vacua, Pre-determination ? Why Standard Model Group ? 23-11-2017 14:30 Aula Seminari Giancarlo Cavanese Strinati (Camerino Univ.) Calculation of the critical temperature for Fermi superfluid throughout the BCS-BEC crossover. 26-10-2017 14:30 Aula B.Touschek Pantaleo Raimondi (ESRF) PDF The ESRF status project. 13-07-2017 11:00 Aula Seminari A. Conti (CEA Saclay) Numerical model fully depicting nanoparticle uptake within brain after ultrasound induced Blood-Brain Barrier opening. 11-07-2017 16:30 Auletta A-1 Paolo Panci Blackboard Seminar: My recent research interests on Dark Matter and Flavour Anomalies. 23-05-2017 16:00 Aula Seminari Corrales Morales Yasser Identified hadron production and study of collectivity phenomena in small system at the LHC with ALICE. 28-02-2017 13:30 Auletta B-1 Tripolt Ralf-Arno (ECT*, Villazzano (TN)) PDF Resonances Via Pad? 12-10-2016 15:00 Auletta Leale dott. Andrea Zappettini, CNR PDF Development of CdZnTe X- and gamma-ray detectors for security, environmental monitoring, and medical applications. 13-09-2016 14:30 Auletta Leale Pavel Larionov PDF Quality Assurance and radiation tolerance studies on double-sided silicon sensors of the CBM Silicon Tracking System. 06-07-2016 08:00 Aula B.Touschek Simona Fiori Aggiornamento normativo su contabilit? 05-07-2016 08:30 Aula B.Touschek Simona Fiori Aggiornamento normativo su contabilit? 21-06-2016 11:00 Aula Seminari Sourendu Gupta (TIFR) Does the 1/N expansion have a finite radius of convergence? 15-06-2016 14:30 Aula B.Touschek Prof. R. Bonifacio PDF What is Time? 16-05-2016 14:30 Auletta Leale Dr. Beatrix Hiesmayr, Univ. of Vienna PDF The Pauli principle or other fundamental questions: how to test? 10-05-2016 11:00 Aula Seminari V. Ohanyan (Yerevan State Univ.) NON- PLATEAU BEHAVIOR OF THE ZERO-TEMPERATURE MAGNETIZATION IN SPIN-CLUSTERS AND CHAINS. 07-04-2016 14:30 Aula B.Touschek Fred Jegerlehner (DESY) PDF Is the Higgs boson the inflaton? 15-12-2015 16:30 Aula Seminari A. Dolgov Observations of astrophysical objects which cannot exist. 10-09-2015 15:00 Aula Seminari Marco Nardecchia (Cambridge Univ.) PDF Flavour physics after LHC-1, what's next? 29-07-2014 15:00 Auletta Leale V.A. Matveev, Institute of Theoretical and Expermental Physics, K+ Xe interactions below 560 MeV/c. 21-11-2013 15:00 Aula B.Touschek Sante Carloni (Karlova Univ.) PDF Dark Universe and Marvels of Gravity: exploring the idea of a geometric interpretation of the Dark Phenomenology. 30-07-2013 10:00 Auletta Leale Prof. Vicente Vento, Univ. Valencia Glueball: to be or not to be? 27-06-2013 15:00 Aula B.Touschek R. Petronzio PDF Il progetto tau charm: un acceleratore italiano per la fisica del sapore con applicazioni interdisciplinari. 26-06-2013 15:00 Aula Seminari Fred Jegerlehner (DESY Zeuthen) The Standard model as a low-energy effective theory: what is triggering the Higgs mechanism? 25-03-2013 15:00 Aula Divisione Acceleratori A. Stecchi PDF !CHAOS: a new approach to Control Systems. 27-06-2012 15:30 Aula B.Touschek P. Francavilla (CERN) PDF Jet Physics in ATLAS. 31-05-2012 15:00 Aula B.Touschek Frank Patrick (SLAC) PDF Do We Know the Temperature of Earth? 07-10-2011 15:00 Auletta Leale Dr. Beatrix C. Hiesmayr, Univ. Vienna Entanglement in a Relativistic Setup and for Neutral Kaons: what did we learn so far? 14-07-2011 15:00 Aula B.Touschek A. Chubukov PDF Back to the iron age? the physics of Fe-pnictides. 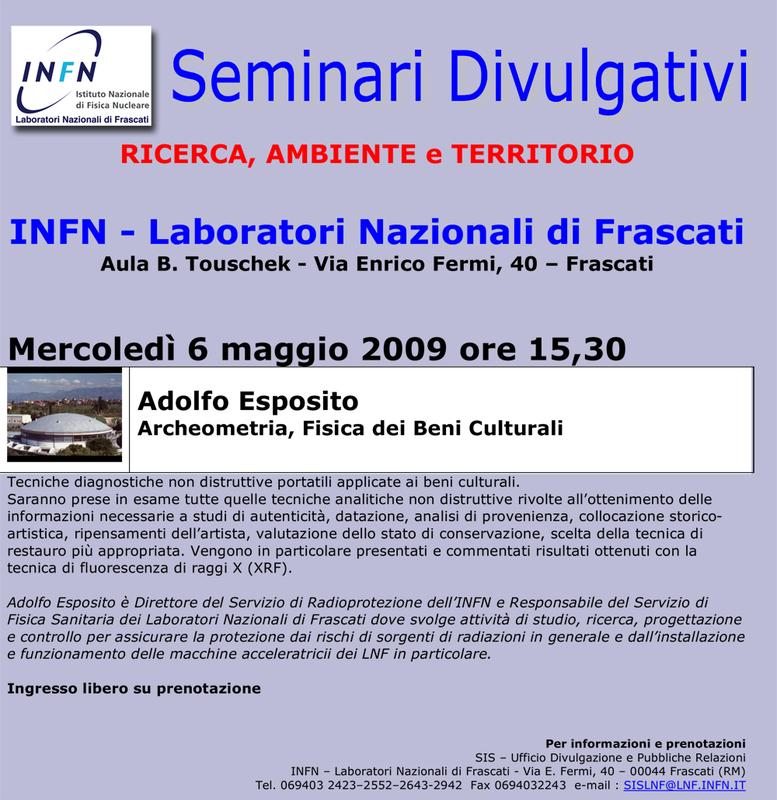 08-06-2011 15:00 Aula B.Touschek Paolo Saraceno PDF Il mondo fra trent'anni, e' possibile uno sviluppo sostenibile? 20-04-2011 15:00 Aula B.Touschek Giulio Valli PDF Three Mile Island (1979), Chernobyl (1986), Fukushima (2011) - Una riflessione sull?energia nucleare. 13-01-2011 15:00 Aula Seminari Cruz Zaragoza Epifanio (Mexico Univ.) PDF Studies for the development of a customized reader for the characterization of thermoluminescent materials. 24-11-2010 15:00 Aula Seminari Dr. Gustavino Carlo, LNGS L'esperimento LUNA ai Laboratori del GranSasso. 12-07-2010 14:30 Aula Seminari Yevgeni Sh. Mamasakhlisov, Yerevan State University Exactly solvable models for description of biological molecules. 02-07-2010 10:00 Auletta Leale Prof. Gary R. Goldstein, TUFTS University Will strange and charmed hyperons continue to have large polarizations at LHC kinematics? 27-11-2009 10:30 Aula Seminari Giordano Patrizi SCF Meeting: "EGNOS and EDAS"
16-04-2009 13:30 Auletta B-1 Mauro Maiello SCF Lunch seminar: "The BRAIN-MBI experiments on the Cosmic Microwave Bkg"
18-12-2008 14:30 Auletta A-1 Kumar Di-photon production in extra dimensional modelsto NLO in QCD at the LHC. 29-10-2008 15:00 Aula B.Touschek Steve Adler, IAS - USA PDF Can the flyby anomaly be attributed to earth-bound dark matter? 21-12-2007 15:00 Aula Seminari S. Di Matteo, Lab PALMS, U. de Rennes-1 The phase diagram of V2O3. 05-12-2007 15:00 Aula Seminari Wang Yifang (IHEP, Beijing) From BEPC to Daya Bay - An introduction of particle physics in China. 30-11-2006 15:00 Aula B.Touschek O. W. Greenberg (Maryland U.) A schematic model of generations of quarks and leptons. 07-07-2006 15:00 Aula Seminari Y. Nir What is special about the neutrino flavor? 04-07-2006 11:30 Aula Seminari Yosef Nir Spring Institute: What is special about the neutrino flavor? 04-07-2006 15:00 Aula Seminari M. Wise M. Wise: "Modifications of the Properties of the Higgs Boson"
12-05-2006 15:00 Auletta B-1 V. Branchina (IReS, Strasbourg) Effective potential (in)stability and lower bounds on the Higgs mass. 25-01-2006 15:00 Auletta B-1 Michael Creutz "Spontaneous CP violation in the strong interactions and quark mass ambiguities." 07-09-2005 14:30 Aula Seminari Prof. D.Lanskoy, Moscow University "Advanced topics in Hypernuclear Physics"
07-04-2005 17:00 Aula B.Touschek Antonio Riotto PDF Primordial inflation explains why the universe is accelerating today: was . . .
25-01-2005 11:00 Aula Seminari Michael Creutz (BNL) "Spontaneous CP violation in the strong interactions and quark mass ambiguities." 25-01-2005 15:00 Aula B.Touschek Prof. E. Kotomin (Max Planck, Stuttgart) "Ab initio calculations of ABO3 perovskite surfaces"
13-12-2004 15:00 Aula Seminari Prof.R.GODBOLE - Bangalore Univ. THEORY SEMINAR - Prof.R.GODBOLE,Bangalore Univ. 04-06-2004 15:00 Aula B.Touschek Prof. Alessandro Variola (CERN) Shall we see the light from anti hydrogen? 23-03-2004 15:00 Aula Seminari Dr.Y.IWAMURA (Mitsubishi Industries) PDF REPRODUCIBLE COLD FUSION RESULTS AT MITSUBISHI LAB. 22-03-2004 13:30 Aula Seminari Dr McKubre - Stanford Research Institute. Seminario ENEA "Cold Fusion a 15 year reflection"
17-03-2004 11:30 Aula Seminari D. Giulietti (Pisa U.) PROBLEMATICHE SPERIMENTALI DELL' ACCELERAZIONE DI ELETTRONI IN ONDE DI PLASMA. 15-03-2004 15:00 Auletta A-1 R.WIGMANS - Texas Tech. Uni. & INFN,Frascati PeV Cosmic Rays - A Window on the Leptonic Era? 11-03-2004 15:00 Aula B.Touschek G. Barbiellini (U. Trieste) PDF GRB: a luminous candle? 22-01-2004 14:30 Aula B.Touschek F. Burgio Equation of state of Nuclear Matter and Neutron Stars' structure. 08-09-2003 14:30 Aula Seminari Prof. Lev LIPATOV, St.Petersburg, Russia Seminar "BFKL and DGLAP evolution equations in the supersymmetric gauge theories"
16-07-2003 15:00 Aula B.Touschek Min Jeong Kim PDF Status and prospects of the Tevatron and CDF detector in Run 2. 19-06-2003 15:00 Aula Seminari P.Q.HUNG - VIRGINIA UNIV. THEORY SEMINAR Dr.P.Q.HUNG - VIRGINIA UNIV. 14-05-2003 14:30 Auletta A-1 N. Beisert (Potsdam, Max Planck Inst.) BMN Operators and Superconformal Symmetry. 15-04-2003 10:30 Aula Seminari N. Beisert (Potsdam, Max Planck Inst.) BMN Operators and Superconformal Symmetry. 27-03-2003 15:00 Aula B.Touschek R. Barbieri PDF Electroweek symmetry breaking: where do we stand? 25-03-2003 14:30 Aula Seminari P. Horvathy (Univ. Tours) The origins of Noncommutative (Quantum) Mechanics. 21-03-2003 15:00 Auletta A-1 B.ERMOLAEV - St.Petersburg Univ. THEORY SEMINAR Prof.B.ERMOLAEV - St.Petersburg Univ. 06-12-2002 11:00 Aula Seminari Dr.P.DUMAS SEMINAR Dr.P.DUMAS - L.U.R.E.,C.N.R.S., Paris Univ. 20-11-2002 09:00 Auletta T-75 L. Calzetta (Trane Italia) corso "manutenzione gruppi frigo Trane"
20-07-2001 09:00 Aula B.Touschek C. Pontoglio L. Edera Charm meson lifetimes. Study of the decay mode doubly Cabibbo suppressed D+ --> K+pi-pi+. 24-05-2001 15:00 Aula B.Touschek E. Bernieri L'esperimento GEDI e la ricerca fisica in montagna e in siti remoti. 10-11-2000 15:00 Aula Seminari F. Buccella 1) SO(10) and neutrino oscillations; 2) Pauli principle and photon distribution. 01-06-2000 15:00 Aula B.Touschek M. Block Extending the Frontiers. Reconciling Cosmic Ray and Accelerator p-p Cross Sections. 04-05-2000 15:00 Aula B.Touschek E. Chiavassa Experimental Evidente for the Formation of a New Matter State in the Pb-Pb Interactions at Cern SPS. 09-03-2000 14:30 Aula B.Touschek Rita Bernabei Searching for signals from the Dark Universe: latest DAMA results. 11-02-1998 15:00 Aula Seminari PROF.V.A.KHOZE-L.N.F.